Born into a wealthy family, related to popes, youngest of five children, Catherine was a religious and prayerful girl. 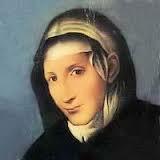 She tried to enter a convent at age 13 but was turned away because of her youth. She was married at 16 to a Genoese nobleman, Giuliano Adorno. They remained childless and her husband was known for his cruelty, violence and unfaithfulness. After Catherine was struck down by a revelation of God‘s love and her own sinfulness she led her husband to the faith and they spent the rest of their lives working with the sick and poor. Her writings have continued her fame. Catherine is patron against adultery, against temptation and for brides, childless people, difficult marriages, people ridiculed for their piety, victims of adultery, victims of unfaithfulness and widows.